Just a few minutes from the hustle and bustle of Wenceslas Square, you will find this peaceful and quiet oasis, the origins of which go back to the 14th century when it belonged to a local monastery of the Franciscan order. And earlier in the year it’s small, rundown playground had a complete facelift and is now 3x it’s original size, offering you respite from Christmas shopping with kids. 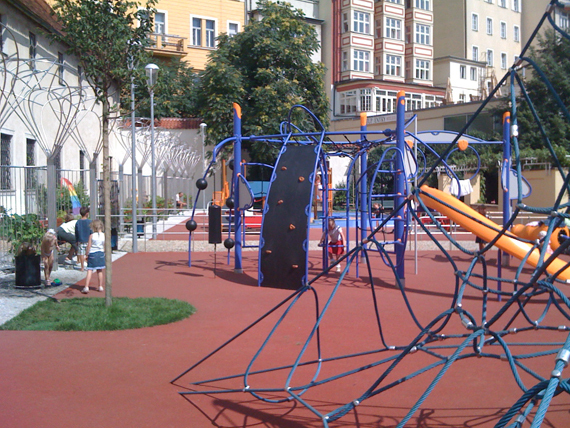 The Frantiskanska Gardens, are a well-sized public garden full of benches, rose bushes, flowers, trees and a brand new children’s playground. The gardens can be accessed via 3 separate points. One way is from Vodickova Street via the ‘Svetozor’ passageway, another way is directly from Wenceslas Square also via the entrance to the ‘Svetozor’ passageway. 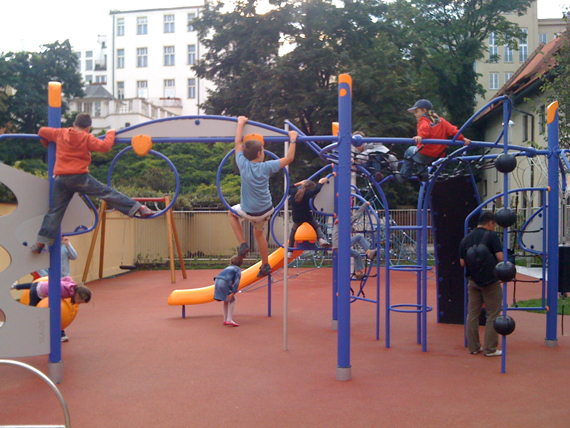 The third way to get in is from Jungmannovo Square which, is located at the bottom of Wenceslas Square. Even though quite a large number of people use the gardens as a through-fare between Jungmannovo and Wenceslas Squares, the place is still extremely peaceful and you can get your (relative) privacy by finding at quiet spot at one of the many white-painted benches situated along the hedges. There are also public toilets with wheelchair access. Frantiskansa Zahrada is a baroque garden built in a French Garden style. The centre is dominated by a square pavilion, which is surrounded by a herb garden and a small fence. Following the forced removal of the monks from the monastery in 1950, the gardens were opened to the public and were fully renovated during 1989 to 1992. 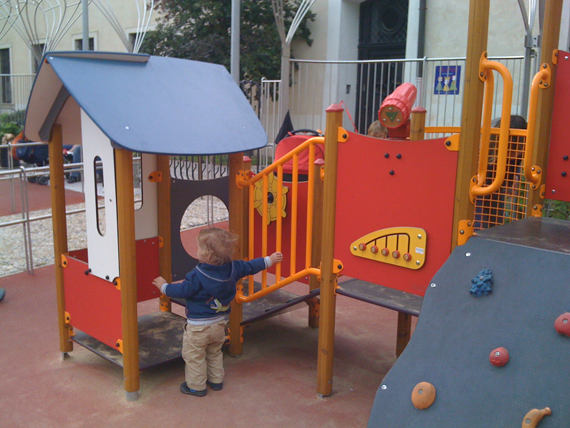 The playground area is 3x larger than previous and is partly obscured by a high wall. 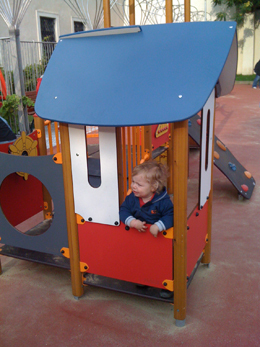 The area is covered in thick rubber matting and equipment is sorted into big kid and little kid areas. Big kids will be occupied by several complex climbing frames including a rope pyramid plus a swing. The little ones have a large sandpit with climbing frame, a small house with climbing bridges plus the usual roundabouts, see-saws etc. If you feel like a food & drink break, then check out Café Postu located on the Jungmannovo Square side of the park. This coffee shop is quite amazing in that it offers many types of services including massages and fitness classes for adults and children. There’s even a kids’ corner to escape to in case of rain outside. 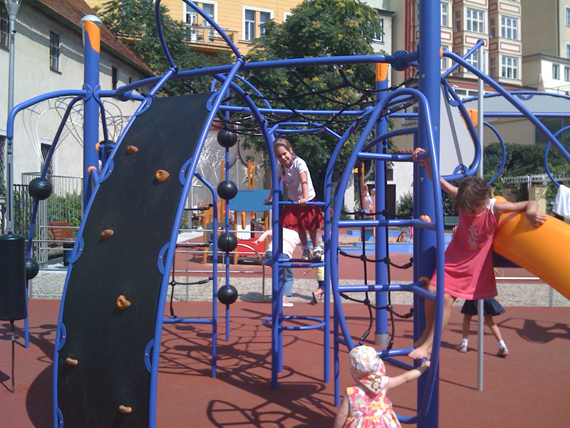 The only negative about the Františkánská playground is the lack of shade during summer, it can get quite hot here! But hey it’s a fantastic facility given it’s close proximity to one of the busiest parts of Prague and many of us crave a little sun outside the peak summer months. 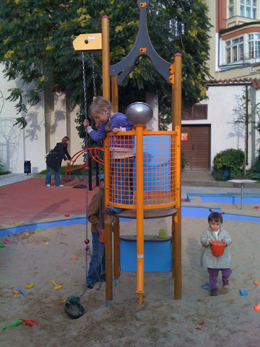 Thanks to Larissa for providing new photos of the playground! DIRECTIONS: By Metro: Green Line A to Muzeum or Mustek. Just walk down Wenceslas Square and turn into Svetozor passage. Alternatively, catch the Yellow Line C and get off at Mustek and enter the garden directly via Jungmanova Street.